A loose adaptation of Wilkie Collins’ The Woman In White, Humraz is a clumsily and tackily made film even though old-timers still regard it as one of the better films to come from across the border. It proves yet again that mainstream Pakistani cinema was way behind its Indian counterpart in terms of technical virtuosity, production value and cinematic storytelling. You feel this even more so, when the film is seen against an earlier extremely well-crafted Indian film that also took Collins’ tale as a base, though treating its story quite differently, Raj Khosla’s Woh Kaun Thi? (1964). 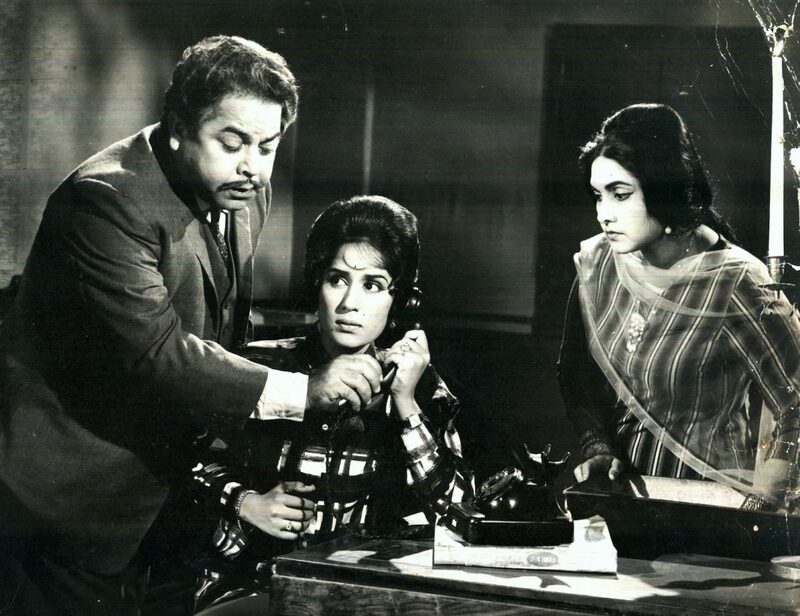 Right from the sloppy beginning, which otherwise should have drawn you into the film straight-away as Doctor Javed (Mohammad Ali) meets the mysterious Shehzadi (Shamim Ara), you know you’re in for a rough ride. This, even as the film uses the broad plot points of Collins’ tale – the two similar looking girls, one terminally ill, getting switched in a bigger picture involving a large chunk of property at stake. However, the suspense inherent in the story doesn’t come through, the plotting of the mystery element is weak, and the film lacks solid twists and turns. It is slow moving and devoid of crests and troughs, which makes for tedious viewing. Looking at it today, I would say that it is not a particularly good outing for Khwaja Khurshid Anwar, who directed the film besides co-producing it and scoring its music. But at the time, the film did draw positive reviews and was a success at the box office in Pakistan so in that sense, I suppose he achieved what he set out to do. Coming to the performances, Shamim Ara does what she can with the double role, managing to treat both quite differently, not just with her two different looks but her voice modulation as well. She fares much better as the Westernized terminally ill Shehzadi, which also is the better fleshed out role of the two. The traditional Bano, on the other hand, suffers from a weaker characterization and it has to be said, has no proper build up in her scenes with Doctor Javed for her to fall in love with him. We have to simply accept their falling in love because a hero and heroine must fall in love and not because their interactions would have us believe so. Ali doesn’t have much to do except look confused and is even kept out of the plot for large chunks as he is told it is a personal family affair and he is not welcome at all around the haveli. Talish is an effective enough wicked uncle after the property, wanting both Aras out of the way, while Meena Shorey, once the ‘Lara Lappa girl’ and hearth-throb of a generation, is so-so in one of her last roles of any importance – of the wicked Governess of Bano, Husn Ara, who, it is revealed, is married to Talish. The technicalities are not much to write about, the narrative flow is choppy and even what should have been the big strength of the film, Khurshid Anwar’s music, is just about adequate, nowhere reaching the heights of his scores in films like Intezar (1956) or Koel (1959). Noor Jehan’s Kahan Ho Tum Saheliyan is easily the standout song of the film, both in its composition and in its picturization on Shehzadi ‘celeberating’ her 19th birthday in isolation. All in all, Humraz is a dull and dated telling of Wilkie Collins’ engaging and suspenseful tale.